Our Amgen Stock Prediction in 2019 (Up or Down)? Throughout the first month of 2019, biotechs were among the strongest stocks. The NASDAQ Biotechnology Index, which has more than 200 biotech stocks, returned better than 13% for January. For comparison, the S&P 500 returned a little less than 8% over the same period. In recent weeks I’ve looked at Celgene (NSDQ: CELG), Gilead (NSDQ: GILD), and Biogen (NSDQ: AMGN), three of the “Big Four” in the industry. Today, we take a look at the fourth member of the biotech “Big Four,” Amgen (NSDQ: AMGN). By both market capitalization ($118 billion) and revenue ($23.7 billion), Amgen is the largest of the four. In 2018, the company offered seven drugs with more than $1 billion in sales. However, four of those seven are in decline. Amgen’s two biggest blockbusters are Enbrel and Neulasta. Enbrel is a wonder drug that treats various autoimmune diseases. It was first approved in 1998 to treat adult rheumatoid arthritis, but its label has expanded several times. Under the latest approval from the U.S. Food and Drug Administration (FDA), Enbrel is used to treat plaque psoriasis. The more conditions the drug can treat, the longer the shelf life and the more money the company can squeeze out of the drug. Extending the life and exclusivity of a drug is crucial for any drug company. Over time, competing drug companies can develop similar branded drugs. And once patents expire, generic competition—called “biosimilars”—can also emerge. This creates downward price pressure. As for Neulasta, it is given as an injection after a chemotherapy session to stimulate the generation of white blood cells. Chemo can greatly weaken patients’ immune system, and Neulasta is used to help protect them against infections. 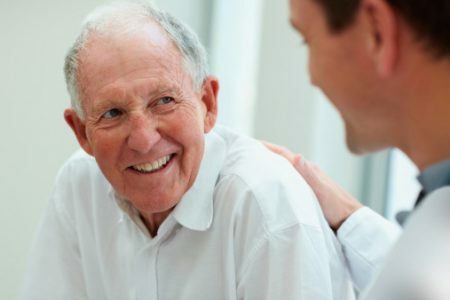 The FDA approved two Neulasta biosimilars in 2018. The first biosimilar has already launched and they will both challenge Neulasta this year. There’s also a new biosimilar for Amgen’s Epogen, which treats anemia. Still, Amgen has several other drugs that are driving growth. I will talk about them below. How Has Amgen Stock Performed? As you can see in the following chart, Amgen stock has done quite well over the past 10 years. If you had invested $5,000 a decade ago in Amgen, you’d be sitting on about $20,000 today. Unlike the other three biotechs, Amgen hasn’t enjoyed a sudden growth spurt in the last 10 years. Instead, it has delivered steady growth year after year. Over the past 10 years, sales grew by 58.3% (4.7% annualized). Neulasta and Enbrel have been the superstars for years. But in recent years Prolia/Xgeva has become a key growth driver as well. Prolia/Xgeva was first FDA-approved in 2010 to treat women with high risk of bone fractures from osteoporosis. The label later expanded to include men and the drug also gained approval in 2011 to treat bone loss in patients undergoing hormonal therapy for breast or prostate cancer. The drug is sold under the Prolia name when used to treat osteoporosis and Xgeva when intended for cancer patients. In 2018, Prolia sales grew to $2.3 billion and Xgeva to $1.8 billion. 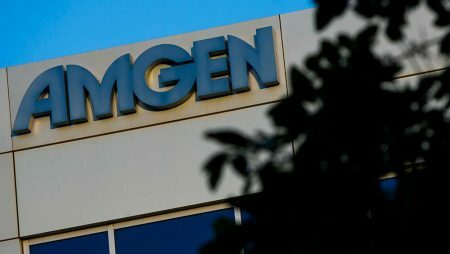 The two products (really the same drug, just different names) actually had more than $4 billion in total sales, making it Amgen’s clear Number Three and the biggest recent success. Kyprolis, which was approved in 2012 to treat multiple myeloma, is on the cusp of crossing the billion-dollar mark as well. Its sales reached $968 million in 2018. 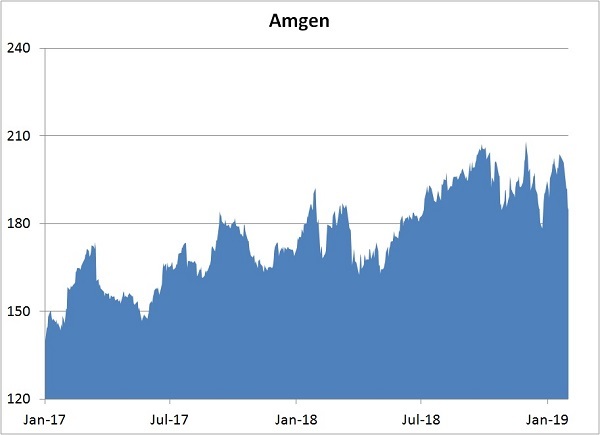 How Has Amgen Stock Performed In 2017/2018? Amgen was the only stock of the Big Four to perform strongly in 2017 and 2018. Its newer drugs like Prolis/Xgeva and Kyprolis kept revenue growing and investor sentiment positive. Repatha is another key drug to watch. The FDA first approved it to treat high cholesterol in 2015, but the label was expanded in late 2017 to include heart attack and stroke prevention. Repatha belongs to a new class of cholesterol-lowering drugs called PCSK9 inhibitors. Hopes were high for the drug. It got out of the gate slowly because the cost was very high compared to traditional treatment (statins), but lately sales have picked up. The FDA approval to use Repatha for prevention of heart attack and strokes helped to make insurance companies more willing to pay for the drug. PCSK9 inhibitors are also safer than statins. Amgen’s willingness to lower the price tag helped to drive uptake as well. In 2018, Repatha sales increased to $550 million, a whopping 72% jump over the previous year, and it appears to have a chance at becoming a multi-billion dollar drug and Amgen’s future top-selling drug. Aimovig, co-marketed with Novartis (NYSE: NVS), was just FDA-approved in May 2018 to treat migraines. This drug also has a chance at becoming a blockbuster in a few years. Fourth-quarter sales were $95 million. Mylan is a $15 billion generic-drug specialist, while Coherus is a small-cap biosimilars specialist. Both comparnies gained FDA approval in 2018 to market biosimilars to Amgen’s Neulasta. Mylan, which got the FDA nod in June, has already launched the Neulasta copycat at about two-thirds of Neulasta’s price under the trade name Fulphila. No official sales total is available yet. One particular analyst thinks Fulphila could bring in $150 million this year. Coherus got approval in November and has announced it will also price its biosimilar version at about two-thirds of Neulasta’s price. Its biosimilar will be called Udenyca. Sanofi is a French drug company. Regeneron is American. The two companies co-developed Praluent, anotherPCSK9 inhibitor, just like Amgen’s Repatha. Sanofi and Regeneron split profits from U.S. Praluent equally, and Sanofi gets the bigger chunk of ex-U.S. profits. Praluent was the first FDA-approved PCSK9 inhibitor, and Repatha followed one month later, so the two drugs are understandably quite often compared to one another. Both suffered from high-price issues and slow sale ramp ups. Both reduced their prices. As mentioned above, Repatha has gained FDA approval as a prevention treatment for heart attack and strokes. Praluent is now under FDA review for the same thing as well. Fourth-quarter 2018 sales of Repatha were $159 million. Sanofi and Regeneron haven’t reported fourth-quarter figures yet, but Praluent sales were just $77 million in the third quarter. Celgene’s Revlimid is most commonly prescribed drug to treat multiple myeloma (MM). A combo of Revlimid and dexamethasone is the standard care for MM. Interestingly, study shows that when Amgen’s Kyprolis is added to Revlimid/dexamethasone, the risk of death is reduced. The FDA has approved use of Kyprolis both as a standalone and in combination with those two drugs. Even though Kyprolis and Revlimid are competing drugs, they are sometimes used together. Will Amgen Stock Go Up In 2019 (Should You Buy)? Despite the likelihood of greater biosimilar threat to Neulasta in 2019, Amgen’s newer drugs like Repatha, Prolia/Xgeva, and Kyprolis all grew at double-digit percent rates in the fourth quarter. So at the very least, Amgen has several winners ready to pick up the slack from whatever decline comes from Neulasta and Epogen in 2019. Compared to traditional drugs, biotech drugs offer better protection against generics because biotech drugs are large complex molecules that are hard to duplicate exactly. For example, a difference in the manufacturing process could make the biosimilar less effective or even toxic. So while there will be more biosimilar competition, it remains to be seen whether this class of drug will really take a big bite out of Amgen’s sales. Amgen’s portfolio is well diversified and its proven ability to squeeze more out of mature drugs like Enbrel and Neulasta strongly suggests that it can also lengthen the shelf lives of its newer drugs by finding new uses for them. 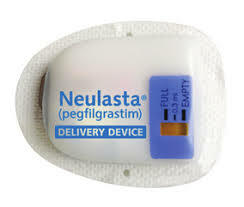 As successful a drug as Neulasta is, it accounts for just 20% of overall sales. The generic threat is well known, so unless 2019 results are quite bad—say, if overall sales drop by 5% or more—the shares should do okay. Amgen also has a deep pipeline, though the most interesting candidates are still early in development. There will be some early-stage data readouts. Positive results would boost the stock price. Will Amgen Stock Go Down In 2019 (Should You Sell)? Although biotech drugs are harder to copy, the fact is that Neulasta and Epogen biosimilars have been approved. That means the FDA deems them safe and effective. The hardest hurdle has been cleared. The market acknowledges the biosimilar risk but judging by price action it doesn’t expect a huge decline. If early sales figures show that the uptake of the biosimilars are strong at the expense of Neulasta and Epogen, Amgen stock will likely take a hit. Sales momentum for Amgen’s newer drugs could slow as well, which would also be a negative on the share price. Amgen doesn’t really have “the next big thing” in the late stage of development, so it will need to lean on current products to keep growth going. While AMGN trades at a premium to the other three Big Four stocks, the forward price-to-earnings (P/E) ratio is still only 13-times projected 2019 earnings. The market is not expecting huge growth nor does it expect a major sales decline. If the actual results surprise either to the upside or to the downside, the share price will act accordingly. Amgen certainly faces downside risks in 2019. However, the stock has proven its mettle in the past. The biosimilars would have to show that they are taking a big chunk of Neulasta and Epogen’s market shares to cause a major fall in the stock price. The biotech industry has had a rough time in recent years, but Amgen has more than hung tough. Its diversified product portfolio provides a layer of defense. 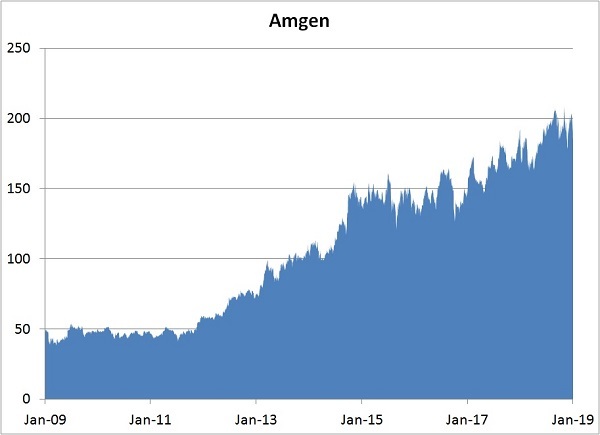 Remember, AMGN is the only stock of the Big Four that’s now trading at a level above its highest point in 2015, a testament to Amgen’s strength. The other three stocks are all at levels below their 2015 heyday. Amgen has ample liquidity and generated more than $5 billion in free cash flow last year. It ended 2018 with more than $29 billion in cash equivalents and short-term investments. The company can always make its shares more attractive through share repurchases and possibly upping its $5.80 annual dividend. As I’ve just explained, Amgen is poised to continue its winning ways, despite the broader market’s uncertain path in 2019. But my colleague, the legendary investor Jim Fink, has developed a system that pinpoints under-the-radar stocks that generate huge profits, regardless of the market’s ups and downs. Jim’s system just hit on three companies that could put up to $330,000 in your pocket. Want to know the details? Click here for a free presentation.